Save for dermatologists, there are seldom folks who are as knowledgeable about the inner workings of our epidermis as aestheticians. Like doctors, they’ve seen it all: acne, hyperpigmentation, scarring, and rosacea. The main difference is you’re probably not going to book a facial if you’re having an eczema flare-up. While facialists certainly see their fair share of skin concerns, it’s their job not to prescribe drugs, but rather to provide treatments that help soothe and transform the skin over time. What’s more: Said treatments are usually super tranquil and administered on a sleep-inducing spa table. Aside from the relaxation factor, another tempting reason to see a facialist (interchangably called aesthetician), is the personalized approach. Most of the time these complexion caregivers work by meticulously examining your skin and treating it with whatever it needs, whether it’s a heavy dose of hydration, uncomfortable extractions, or a dose of LED light therapy. Celebrities, bloggers, and beauty editors (not to mention everyday folks who crave a clear complexion) rely on aestheticians for balanced, soothed skin that glows — without the highlighter. But, I wonder: How do these skin whisperers care for their own complexions? Because I couldn’t shake the curiosity, I decided to ask. Ahead, find the skin-care routines and secrets of six top facialists. 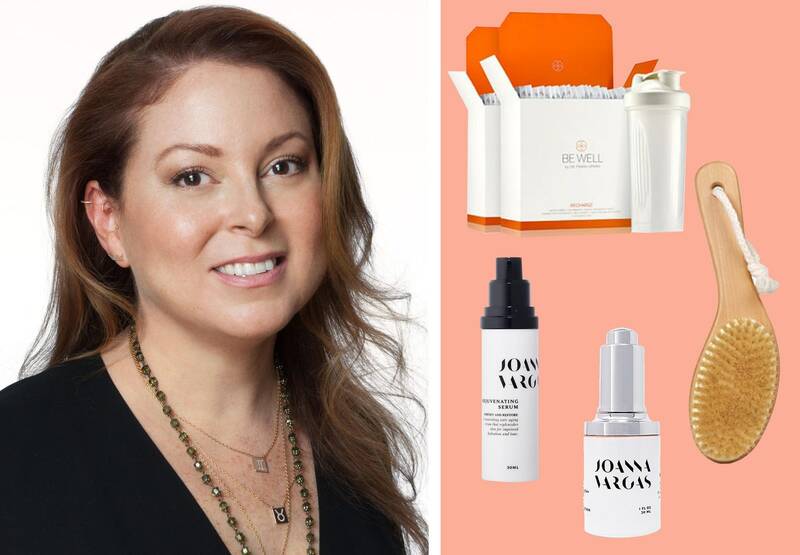 The Hollywood-based facialist and founder of Angela Caglia Skincare prides herself on being a green beauty expert and follows a skin-care meets self-love approach whenever she can. Believe it or not, Caglia’s p.m. skin-care routine is just as streamlined as her a.m. regimen. She generally sticks to removing any makeup and grime from the day with her Power Cleansing Balm, which she says she uses as a cleanser, mask, and moisturizer as she specifically created it to be a multifunctional product. When her skin requires some extra TLC, she turns to Glam Glow’s YouthMud for a deep exfoliation prior to moisturizing. And when she has the time, she loves to give herself high-tech facials and treatments like LED light therapy. “Usually I’m so busy doing all of my clients, but I try to do it every few weeks,” she says. Melissa Haloossim, aka Kim Kardashian’s late-night skin savior, follows a no-fuss approach in the a.m., too. She starts by rinsing her face with cool water before applying SkinMedica’s HA5 Serum, which supports the skin’s own ability to replenish hyaluronic acid. She’s another no-cleanser-in-the-morning advocate, as she says doing this too often can dry the skin. After serum, it’s on to sunscreen. She relies on Allure Best of Beauty winner, EltaMD’s UV Clear Broad-Spectrum SPF 46, before applying Bare Minerals Original Powder Foundation because it also contains a small dose of sun protection. And that’s that. Come evening, the Skin Thesis founder removes makeup and washes her face with a gentle cleanser, followed by the same SkinMedica serum. Then she finishes off with a light moisturizer. Wondering why Haloossim doesn’t dish any brand names when it comes to cleanser and moisturizer? That would be because she’s currently in the process of developing her own product line (!) and has been testing the samples to ensure their effectiveness. “I also exfoliate once a week and use my Clarisonic Brush to make sure I remove all residue on the skin,” she adds. When it comes to caring for your skin, the celebrity facialist and creator of the GLOPulse and GLOLite devices says there are no days off. “I select my skin-care cocktail depending on how my skin feels each day and usually layer up to three serums,” she says. A few of her favorites include Medik8’s CE Thione, Biologique Recherche’s Colostrum, and Environ C-Quence 4+. At night, or when her skin is feeling worse for wear, she likes to use an LED mask with Biologique Recherche’s Crème Masque Vernix, which she says puts the glow back into her skin. She’s also a huge fan of Environ’s 24K Derma-Roller, which she tries to do every night because she says you see the biggest changes in your skin from the constant rejuvenation. When she fancies a really relaxing skin-care treatment, she relies on her Lift and Sculpt Butterfly Stone, which she uses to gently massage her skin with whatever facial oil she’s feeling that day. Despite being a celebrity aesthetician and founder of her own spa and skin-care range, Joanna Vargas keeps it pretty straightforward when it comes to her own regimen. “It’s pretty simple: cleanse at night, then I apply my Super Nova Serum, a retinol, to help encourage more cell turnover followed by my Rejuvenating Serum to help my skin repair itself from a day of stress and pollution,” she says. Then, if she feels like she could use more hydration, she locks the aforementioned products in with a dollop of her Daily Hydrating Cream. “The serum oxygenates and makes my skin glow while the cream helps keep me feeling hydrated all day,” she says. After a long day, Vargas likes to use her famous Vitamin C Face Wash to remove makeup and any lingering debris. “I hate feeling like my skin is dirty so I can’t live without it,” she says. She follows up with the serums from her a.m. routine, and when she feels she needs it, she’ll use her lactic-acid-packed Exfoliating Mask and the Eden Instant Lift Mask, (the latter works to repair environmental damage). Vargas says she loves an at-home lymphatic drainage massage, which she says helps to keep the skin clear, de-puffed, and glowing. “It’s a lost art and certainly a tool that anyone can use to make the face look rejuvenated,” she says. Another skin-care method Vargas swears by is dry brushing. She says it increases elasticity and is a great form of exfoliation that enhances circulation. “Try it before you get into the shower in the morning, and you will see a difference in your skin quality in days,” she says. Unlike some of her peers, aesthetician and skin-care brand consultant Joanna Czech has a more comprehensive routine that includes cleansing, toning, serum, and moisturizing, as well as eye care and lip care, too. Because she suffers from rosacea, she relies on gentle products that help soothe, repair, and protect her fragile complexion. In the a.m., this means reaching for Biologique Recherche’s Eau Micellaire Biosensible, which she uses with one of her own washcloths. Then to tone her skin she uses Tammy Fender’s Roman Chamomile Tonic, which contains a blend of chamomile flower water and oil to hydrate and calm distressed skin. Post-tone, she moisturizes with Biologique Recherche’s Serum Extraits Tissulaires and follows that with Medik8’s CE Thione, Biologique Recherche’s Colostrum mixed with Augustinus Bader’s Rich Cream. For eyes, she uses EvenSwiss Eye Complex and for lips, her favorite is Omorovicza’s Perfecting Balm. A healthy dose of Dr. Barbara Sturm’s Sun Drops and she’s out the door. For Czech, her nighttime routine is the most important because she says the skin is at rest and able to absorb products better, which increases their efficacy. “For cleansing, I alternate between Biologique Recherche Lait E.V and Meder’s Gel Net-Apex Cleanser using a Joanna Czech Linen Washcloth for mild exfoliation,” she says. She then tones with Biologique Recherche P50 400, which, she says, is a must. For her p.m. serums, she mixes the same brand’s Quintessential Serums, depending on what her skin is craving that day. “I use Serum Extraits Tissulaires for balance and hydration and Serum Placenta for healing, brightening, and increasing elasticity,” she says. Once she’s applied her serums, she uses her Joanna Czech Facial Massager to help push the products into the skin and increase blood flow. “Two to three times a week, I also use Environ’s C-Quence Serum 1 for vitamin A and mask with 111Skin’s Rose Gold Brightening Treatment Mask followed by the Deesse LED Mask,” she says. She finishes with a few drops of the Vintner’s Daughter Active Botanical Serum added to either Biologique Recherche’s Masque Vernix or the Augustinus Bader Rich Cream. For soft and supple limbs, Czech likes to use Environ’s Dermalac Lotion mixed with its A, C, & E Oil and applied with Biologique Recherche’s Massage Gloves. And when her rosacea is flaring up, she says she pares down her routine to four simple products: Meder’s Gel Net-Apex Cleanser, Tammy Fender’s Roman Chamomile Tonic, and Vintner’s Daughter Serum mixed with Biologique Recherche’s Creme Masque Vernix. Celebrity facialist and creator of Shani Darden Skin Care starts her mornings off by masking with the same Deesse LED Mask that Czech favors. After 20 minutes, she applies a toner and vitamin C serum for antioxidant protection (she prefers iS Clinical’s GeneXC), followed by the iS Clinical Youth Eye Complex, which has peptides and hyaluronic acid to plump up and brighten the undereye area. After attending to her clients all day, Darden comes home and starts her routine with a thorough cleanse using iS Clinical’s Cleansing Complex, which contains skin-loving ingredients like vitamins C and E.
Additionally, once a week at night she’ll do an at-home chemical peel to exfoliate and brighten her skin. “I love the Dr. Dennis Gross Alpha Beta Peel Pads,” she says. Doesn’t everyone? “One of my little tricks is to exfoliate my lips with a wet toothbrush and apply a lip mask; shedding that dead skin on the surface of my lips allows for the mask to absorb super well,” she says of her favorite lip-smoothing treatment.